On September 17, 1950, more than 68 years ago, the first Turkish brigade left the port of Mersin on the Mediterranean coast, arriving, 26 days later, at Busan in Korea. Turkey was the first country, after the United States, to answer the United Nations' call for military aid to South Korea after the North attacked that year. Turkey sent four brigades (a total of 21,212 soldiers) to a country that is 7,785 km away. By the end of the Korean War, Turkey had lost 741 soldiers killed in action. The U.N. Memorial Cemetery in Busan embraces 462 Turkish soldiers. Turkey's choice in favor of Russia (and against NATO) will surely have repercussions on several wavelengths. The U.S. may or may not fully retaliate by expelling Turkey from the Joint Strike Fighter group that builds the F-35. That will be a decision carrying with it economic considerations in addition to military and political ones. 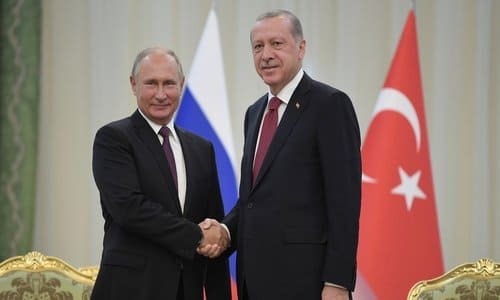 Turkey, if expelled, may turn further to Russia for a next-generation fighter solution, which Putin would only be too happy to offer -- and create further cracks within the NATO bloc, a move Erdoğan probably believes the U.S. administration (and NATO) cannot afford to risk. Erdoğan's gambit, however, has a more important message to NATO than just procuring military gear: Turkey's geo-strategic identity. The S-400 is an advanced air defense architecture, especially if it is utilized against Western (NATO) aerial assets and firepower. It is an elementary military software fact that Turkey cannot use this system against Russian aggression or Russian-made weapons.